With a keen interest in wildlife conservation and large carnivores, Robynne studied BSc Zoology at the University of Pretoria. She stayed on in 2010 to complete her honours degree, which investigated patterns of den use in aardwolf (Proteles cristata) in the northern Cape, South Africa. In 2011, Robynne worked as a co-manager on a game farm in the North-West Province, setting up a breeding programme for rare game and managing both captive and free-ranging large herbivores including buffalo, sable, roan and white rhino. 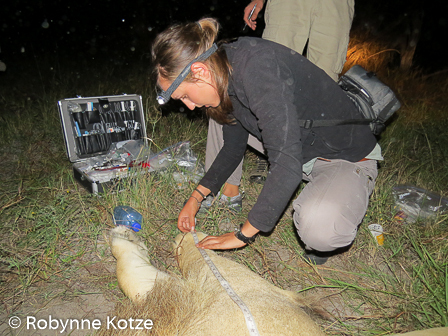 In 2012, Robynne moved to Botswana to start research on lions (Panthera leo) in the south-western Okavango Delta, under Tau Consultants. During the winter months, when the western Okavango was flooded, Robynne returned to South Africa and continued to work on the game management project in the North-West, conducting research in Botswana in the summer. During this time, she completed her MSc Degree, through the University of the Witwatersrand, on lion social organisation and population demographics in the western Okavango Delta using historical data from the area. Robynne is currently completing her field work, which will contribute to her PhD, based on her lion research in the western Okavango Delta. In 2017, Robynne joined the Trans-Kalahari Predator Programme to assist in camera trap surveys of the Okavango Delta and other protected areas in Botswana. She is also completing field work for the Trans-Kalahari Predator Programme aimed at examining connectivity between the western Okavango Delta and Namibia, aligning with the programme’s goals to establish secure corridors for lion movement within the KAZA landscape.